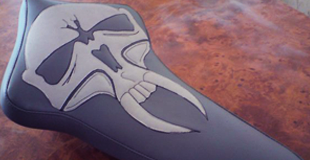 Whether your seat has tear or it's missing some foam, we can provide you with a motorcycle and scooter seat restoration service that can have your seat looking and feeling like new, in no time at all. For a complete seat restoration service at a competitive price, you can rely on our team for all seat re-foaming and reconditioning. Having accomplished many years of experience as well as using the latest equipment, we can help all customers deal with a wide range of motorcycle and scooter seat restorations. For more information, get in touch with our team of experts. If you are in a hurry and your seat isn’t badly damaged, then we may be able to do a same day service. If you think you can benefit from our ‘while you wait service’ please don’t hesitate to call and get your appointment booked in today. If you require your old seat to be recovered, get in touch with our team today on 07977 874 075.